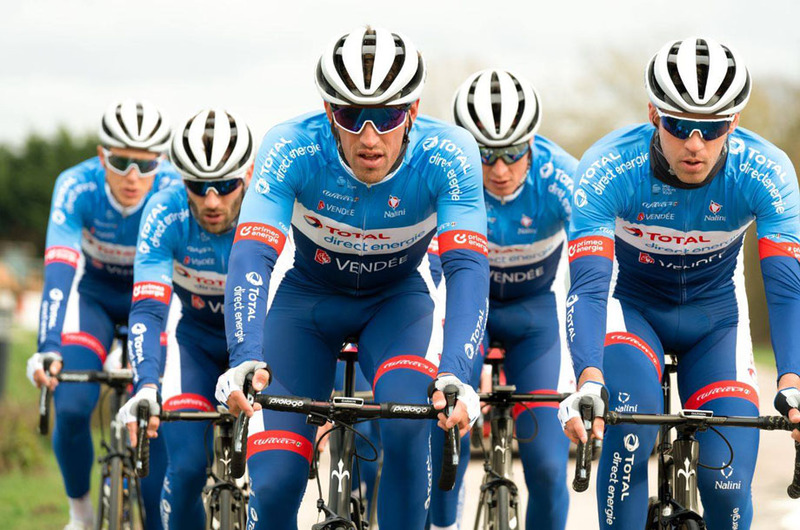 The French team will wear the brand-new uniform at Paris-Roubaix, on Sunday April 14th, becoming their cycling season kit onwards. On April, 14th Total Direct Énergie pro’-team is going to race the “Queen of the Classics” wearing a completely updated kit by Nalini, the historic sportswear company based in Mantua (Italy). The uniform turns from yellow and black into blue, light blue, red and white which are the distinguishing colors of Total, oil and gas giant and new main sponsor of the team. ""Renewing the team’s cycling kit during the season is a great challenge - Nalini owner Claudio Mantovani explained – "but we’re facing this challenge with great enthusiasm. As requested, we have designed a jersey very different than the previous, matching the colors to create a new team identity." Each athlete has been given his tailor-made official cycling kit, which delivers ergonomic fit, aerodynamic performance and comfort to the rider thanks to the utmost care taken by Nalini. The new graphics is both on racing kits and on all the customized clothings including a number of equipments such as bodysuits, accessories, underwear and feed bags. Moreover, Nalini has manufactured the same colors on the replica kit, including short and long sleeves jerseys, bibshorts and accessories, available for teams’ fans, on sale in the best cycling shops with a global distribution.